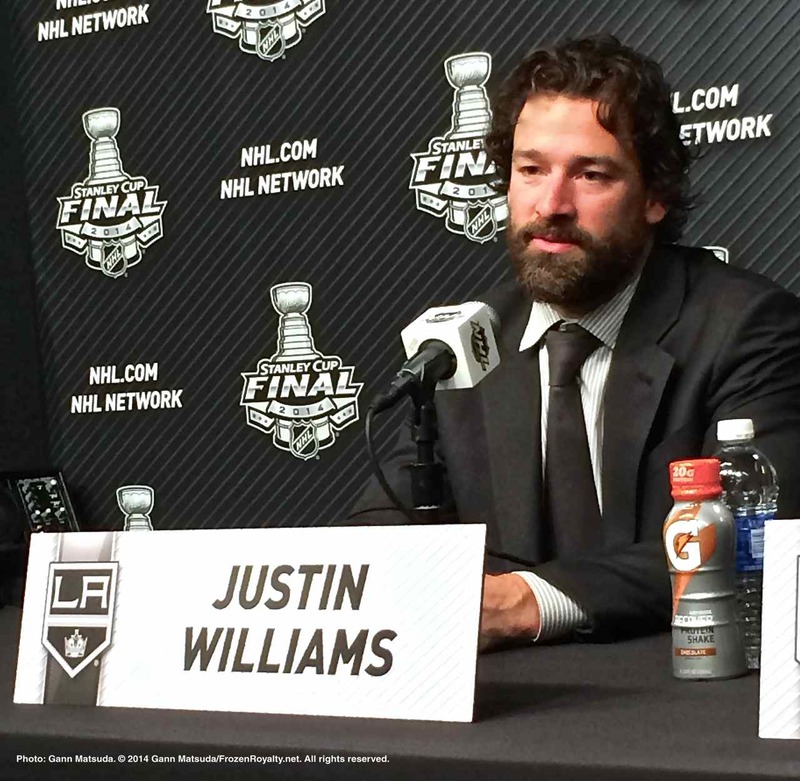 LOS ANGELES AND EL SEGUNDO, CA — Back in early March 2009, when the Los Angeles Kings acquired veteran right wing Justin Williams, many people, including yours truly, expressed concern about the deal, given Williams’ lengthy injury history. Indeed, before joining the Kings, Williams had played a full, 82-game season just twice. From 2000-01 to 2008-09, he suffered injuries that include broken fingers and hands, a broken wrist, shoulder strains and sprains, a torn anterior cruciate ligament and a torn Achilles tendon. When he was acquired by the Kings, Williams was on injured reserve after suffering another broken hand. At the time of the trade, I panned the deal, stating that Kings President/General Manager Dean Lombardi was taking a huge, unnecessary risk. To be sure, this trade is a huge risk, a tremendous gamble for Lombardi and the Kings, perhaps Lombardi’s biggest wager since joining the Kings. After all, outside of his best two seasons, Williams has not come anywhere close to being the thirty-goal scorer that Lombardi and [former head coach Terry] Murray say he is. To be fair, Williams could suddenly become the Man of Steel, never miss another game and become the thirty-plus goal scorer the Kings so desperately need. But given Williams’ track record, it is far more likely that this deal will just be one more in a long, pathetic history of horrific trades in the Kings’ franchise history and could be a huge setback for Lombardi’s rebuilding plan. One way or the other, we will find out soon enough. The next season, Williams broke his right leg in Phoenix on December 26, 2009. He played in 49 regular season games that year, but upon his return from the injury, he was nowhere near effective, and wound up being a healthy scratch in three of the Kings’ six playoff games against the Vancouver Canucks that season (Canucks won the series, 4-2). At that point, it looked like Lombardi’s high stakes bet was going to be a bust, as so many expected it would. But after that, things started to look up for Williams, who missed just nine regular season games in the 2010-11 season. He has not missed a game, regular season or playoffs, since. Over the last three seasons, Williams has not only put the injury bug behind him, but as he has shown during the Kings’ 2012 run to their first Stanley Cup Championship, and in the 2014 Stanley Cup Playoffs, he has made Lombardi’s bet pay off many times over. Williams has been a key player in the Kings reaching the 2014 Stanley Cup Final, and with his overtime game-winning goal in Game 1 against the New York Rangers on June 4, he is now in the conversation for the Conn Smythe Trophy, awarded annually to the Most Valuable Player in the playoffs. Williams has scored eight goals and has tallied twelve assists for twenty points in 22 playoff games this season, setting career highs in goals, assists and points in a single playoff year. Williams is more than just a Game 7 performer. Although they both entered the National Hockey League in the 2000-01 season, left wing Marian Gaborik did not know much about Williams when he joined the Kings back in early March. Doughty indicated that Williams is one of his favorite go-to guys on the team. Brown indicated that Williams is a clutch player, and not just in Game 7’s. The leadership role Williams plays is at least as important as what he does on the ice. Williams has also helped the young players on the team. After practice on June 6, an unusually large number of media crowded around Williams at his locker stall. In fact, so many were involved in the media scrum around him that the crowd overflowed into center Jarret Stoll and Kopitar’s locker stalls, forcing Stoll to dress elsewhere and Kopitar to move his own media scrum interview to the temporarily vacant locker of backup goaltender Martin Jones. During his time with the media, Williams sounded and appeared to be a bit uncomfortable with the attention. Williams was the total team guy during the interview, deflecting the praise in the direction of his teammates. In today’s Game 2 (4:00 PM PDT, Staples Center in Los Angeles), the Kings will be looking for Williams to do his usual thing…help lead the way, as he did in Game 1.